We’re always on the hunt for cool ways to use hummus, which both Ellen and I make, differently but to the same great effect. She likes roasted red peppers and garlic, while I like to experiment with different flavors. My current favorite mix is garlic, scallions, a bit of ginger and a drizzle of sesame seed oil. Set up three shallow dipping pans, one with flour, salt and pepper; one with beaten eggs; and one with panko. In a medium bowl, combine the spinach, hummus, pignolas and nutmeg, and salt and pepper to taste. Season the chicken with salt and pepper, and place a dollop (1/6th of the total amount) of the hummus mixture on one side of each breast. Fold the breast over the stuffing and pin the open side with two toothpicks. 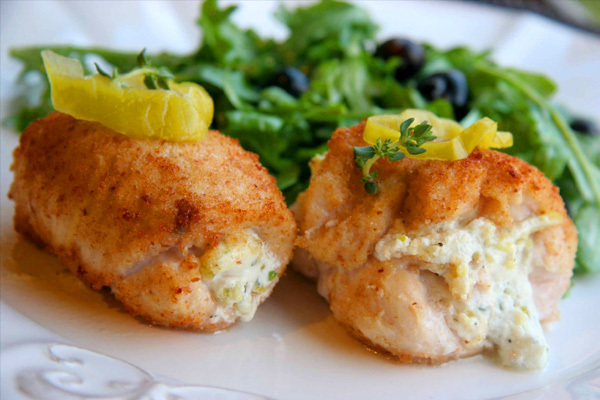 Coat the stuffed chicken breasts with flour, shaking off any excess. Then dip them in egg, then coat the breasts with panko. In a large skillet, heat the butter and olive oil over meduim-high heat until the butter stops foaming. Add two chicken breasts two at a time, and cook, turning once, four minutes on the first side, three minutes on the second side. Adjust the heat so that the chicken browns but doesn’t burn. Transfer the sautee’d breasts to a foil-lined baking sheet, and bake them for ten minutes. Remove from oven, cover with foil, and allow to rest for five minutes. Discard the toothpicks and slice each breast crossways on plates to serve. I served the chicken breasts with a zucchini-Parmesan risotto and roasted asparagus. This is a dinner-party presentation. Folks, the work is worth the effort.